Now a desktop copier/printer that gives you speed, convenience and reliability in a small footprint. 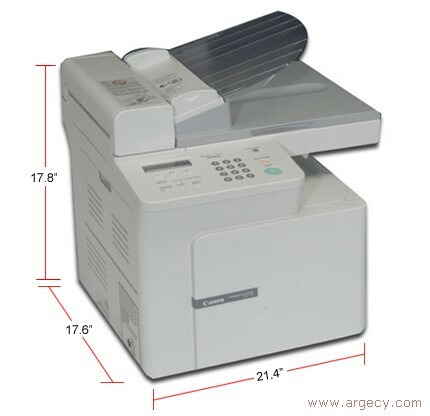 With all the copying features you need, plus a 15 page-per-minute laser printer, the imageCLASS D340 can satisfy any small business or home office user with its quality laser output. A 50-sheet Automatic Document Feeder handles big jobs easily, copying up to legal-size documents. Reduce and enlarge, collate or make draft copies from the easy to use control panel. Printing is fast and easy with Canon's printer driver for Windows. Load paper easily in the 250-sheet paper cassette and your black and white output comes out crisp and fast. Using a single cartridge system, the imageCLASS D340 is economical to operate and easier to use over other machines that have two cartridges requiring replacement at different times. Whether you are a one person office, or have a small staff, the imageCLASS D340 can be your compact desktop solution to replace older single-function machines or as an addition to your current equipment.